This new multifunction printer has a twist. Specifically, it has a 90-degree twist. Instead of feeding the paper through the printer in portrait mode, with the short edge emerging first, the Brother MFC-J4510DW turns it sideways so it prints in landscape orientation. This offers several advantages over the more traditional setup. It can print on A3-sized (11 x 17-inch) paper by taking the page through the printer short end first. A3 pages have to be hand-fed, one at a time through the manual feed slot at the rear of the printer, so it's not suitable for heavy-volume A3 printing. Instead, think of it as an A4 (US letter size) printer that can print the occasional A3 page. Although it can handle A3, unlike its A3 stablemate the Brother MFC-J6910DW, it's no larger than most A4 printers. Measuring just 48cm (18.9 inches) end to end, 29cm (11.4 inches) tall and 18.5cm (7.3 inches) high, it's clearly designed for the home or small office, where space is likely to be at a premium. 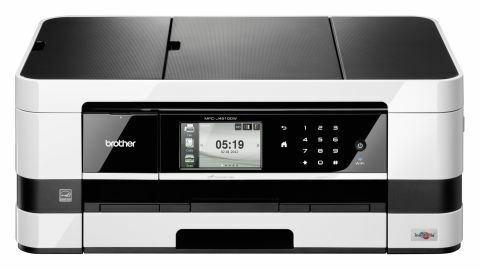 Indeed, the Brother MFC-J4510DW is the first in a series of five J4000-range releases for the small office and home office (SOHO) market, where it's up against printers such as the Canon Pixma MX895 and laser printers such as the HP TopShot LaserJet Pro M275. The Brother MFC-J4510DW has Ethernet and Wi-Fi networking, or you can connect it directly to your computer using USB. It's AirPrint and Google Cloud Print compatible, and you can print directly from USB storage, PictBridge and Media Card ports. Being an all-in-one machine, it can scan and photocopy as well as print, though the flatbed scanner is limited to A4 in size. It can fax too. Its 150-sheet paper tray (up to A4 in size) and 20-sheet automatic document feeder (also A4) make it ideally suited to light office work, and automatic Duplex printing and optional high-yield supplies help bring down the overall running costs. Previous attempts at developing landscape-feed printers have failed due to the paper curling after being output. Brother claims to have solved these long-standing problems using an "innovative rippling process during printing". But does it work? Let's take a look.